The mash-up above represents the feeling I had while attending C.A.M. 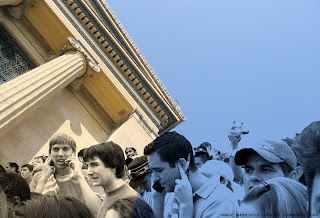 “Museums and Technology” 2010. From the comments at talks I attended, smaller institution folks are not quite feeling the love. I think in the under-funded, under-staffed mass scramble to make sense, utilize, and wow their public, museum infrastructure and staff have gotten a bit overwhelmed. There's a big paradigm shift going on. A major take-away for many was the idea that technology is a tool that the public brings to the museum and that the museum can use to engage with their public. 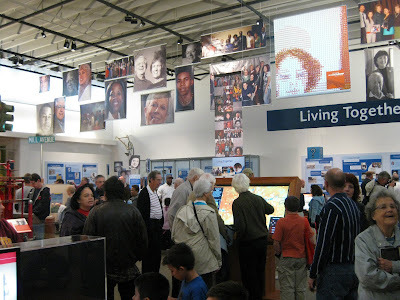 In ye olden days (like, 3 years ago), when I heard “museums and technology” it meant a computer-based interactive in a museum. Now we bring it with us– it’s so ubiquitous that it’s gotten confusing. Instead of pushing content, we’re pulling, sharing, dishing, and mashing it up. Get your museums’ information, expertise out there in ways that were not possible before (beyond the web site). Developing or implementing a strategy of how to phase-in or start fresh to engage with this shift takes some thinking and prioritization-- but the payoffs are huge. In coming posts we’ll look at some of the good ideas the conference raised. It may be that the most effective thing to do is not to reinvent the wheel, but reinvent... or reinforce your thinking. 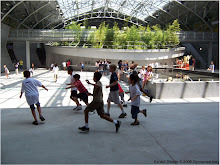 Labels: "california association of museums" "cam 2010" "museums" "museums and technology", "maria mortati"
NY Times: "Panel Proposes Single Standard for All Schools"
This article came out a few days ago from the NYT. It's something that could make our lives easier at the Master Planning and Exhibit Development level as we work to reinforce local vs. national education standards with exhibits. "The new proposals could transform American education, replacing the patchwork of standards ranging from mediocre to world-class that have been written by local educators in every state." This is an ambitious goal and we hope that they are successful in making it work... and work well. PS: as with any suggestion of systemic change there comes debate in case you have the time. With all museum projects there are challenges, and with this project, a tight budget. It is to the team’s great credit that so much was accomplished; by ingenuity, necessity and fortunate timing– to have been funded by the city during booming times, and then building the project during a down economy. But the biggest factor was the cooperation, collaboration and sense of common purpose of all those involved: Architect Phil Weddle and his team, General Contractor Brignall Construction, Exhibit fabricators Motif (now Icon) and the many specialists in their employ, the City of Tempe and most of all to the museum staff. They were responsible for the vision, thematic development, research and many aspects of the installation, in addition to de-mounting the old exhibits and artifacts. In this profession, there is nothing more satisfying than seeing the years (literally) of planning, discussion, cost cutting decisions, design, fabrication and installation culminate in a large crowd watching the ceremonial ribbon-cutting then entering the museum for the first time– filling up the exhibit hall to capacity! By Ron Davis, Principal, LEED A.P. 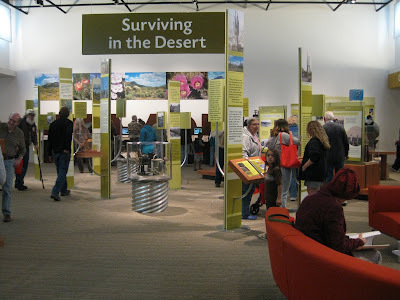 This past weekend was the opening celebrations for the Tempe History Museum in Arizona. This local history institution has been re-born after undergoing a near-total renovation of the architecture and completely a new set of exhibits. Gyroscope Inc., working with Weddle Gilmore Architects, was selected to help the museum re-imagine the existing facility: a re-purposed library building, last renovated in the early 80’s. What had been a dark interior with the original 1980’s exhibits was completely stripped back to the bones. Natural daylight was allowed to flow back in and illuminate the wide-open spaces of the existing structure and new entry addition. Among the project goals were to create inviting spaces and experiences for all visitors, including families. The fabulous turnout for the opening day brought a full spectrum of these visitors; from kids in strollers to octogenarians. Some people recalled the former exhibits and remarked on the transformation, others were making their first visit, and will be back very soon. It was tremendously gratifying to see the response. Gyroscope has launched its own Facebook page. Yes, now you can read this blog there (as well as here), or find out about other projects, news and articles we are following. We're using Facebook to capture cool links, interesting leads, and news. We'll also post photo albums with project images that document our process and give you a sneak peek of our latest projects. As promised, I thought I would offer a case study in this thread. 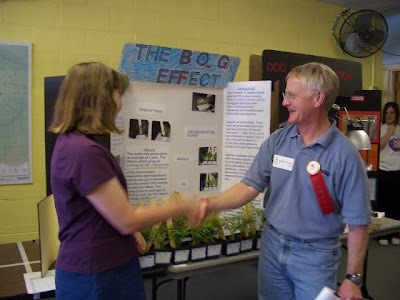 I recently discovered that one of our clients, the Fort Collins Discovery Museum (back then, they were the Discovery Science Center) stepped in to rescue the Poudre School District science fair when it was about to be slashed from the budgets. That was 17 years ago. With the local schools, the Museum now organizes, produces, and hosts the annual fair, using only their staff and resources. According to Jason Wolvington, Associate Director, they focus the science fair on “celebrating participation vs. winning”. reinforcing the relationship between formal and informal education. This takes a lot of effort and some resources on the part of the Museum, but as both a community service and strategic opportunity it’s hard to poke holes in this logic. Just another reason why it's a great match for Museums to be at the National Science Fair table. Photo courtesty of the Fort Collins Discovery Museum. Labels: "maria mortati", "science fairs", "science museums"
And as many of you know, Make Magazine, the founder of Maker Faire (arguably the world's biggest science fair) has been collaborating for a while with science museums to have smaller fairs, "Maker" events, etc. The people behind Make have a deep, thrillingly unbridled passion for informal, hands-on learning. 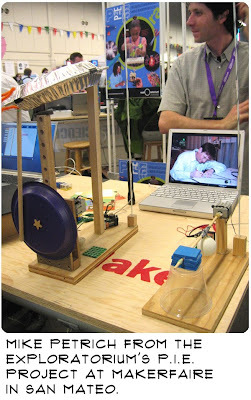 For example, Make already serves as a hub for informal science fair groups of all ages, as witnessed by their list of "Maker Community Groups and Spaces". They also have their own list of "Organizations that Promote Hands-on Learning" from around the world. "Make Magazine has portrayed the work of thousands of makers across America. Now we're looking to discover the most innovative makers whose work has the potential to benefit others. We've created a new event called American Maker... as part of the launch of Science Chicago, a year-long celebration of science." "As part of the Young Makers program, the Exploratorium will host "Open MAKE" on the last Saturday of the month, beginning January 30th, continuing on February 27th and March 27th and concluding on April 24th.The goal of the program is to encourage kids to make, show them different things they can learn to make, and work with kids who'd like to bring some of their work to Maker Faire"
Sounds like a Science Fair to me! Finally, this year will see Maker Faires in 2 cities hosted by the New York Hall of Science, and the Henry Ford Museum.